The entire paratrooper concept was brand new for WWII. The United States had to develop a series of techniques and equipment to support the execution of this strategy. One of the new pieces of equipment that was developed was the paratrooper switch blade. The idea behind the knife was to provide the paratrooper a way out in the event that he had an injured or trapped arm and his parachute was hung on a tree. The knife needed to be readily accessible and have the ability to be opened with one hand. This page is a recognition and identification guide for military fighting knives. Multiple detailed photos of a specific sample are provided. Descriptions point out clearly defined	points that should be noted. One of the most commonly asked questions is "How much is my fighting knife worth?". A price guide is included here to address this question. The value of the knives is reviewed over a period of several years. A trend can be observed. The present worth of the edge weapons in the collector's market is illustrated. 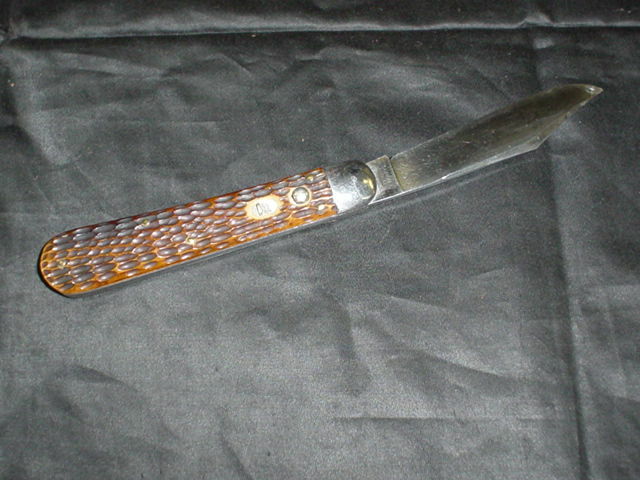 The item featured on this page is a schrade switchblade. This knife was issued to US paratroopers during WWII. The knife had a brown wooden handle. An opening in the handle provided access to the opening button and the safety lock mechanism. Pushing the button activates the spring that opens the blade. The button had to be puched again to close the blade. The safety lock consisted of a slider switch. Moving it in one direction locked the blade in the closed position. Even pressing the release button would not open the paratrooper knife. Sliding the lever in the other direction released the lock. 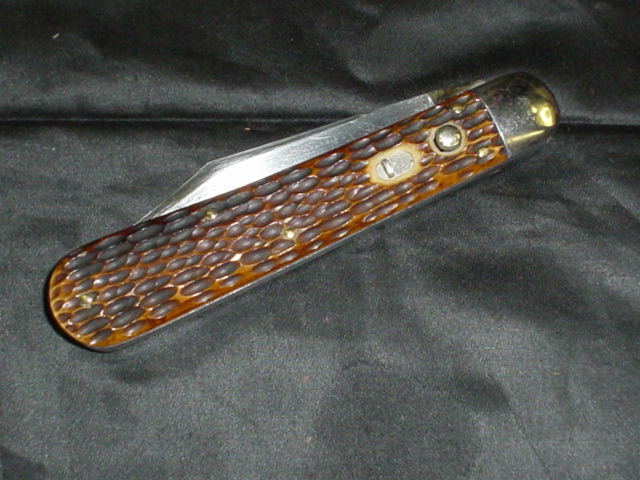 The blade was of single edge design. 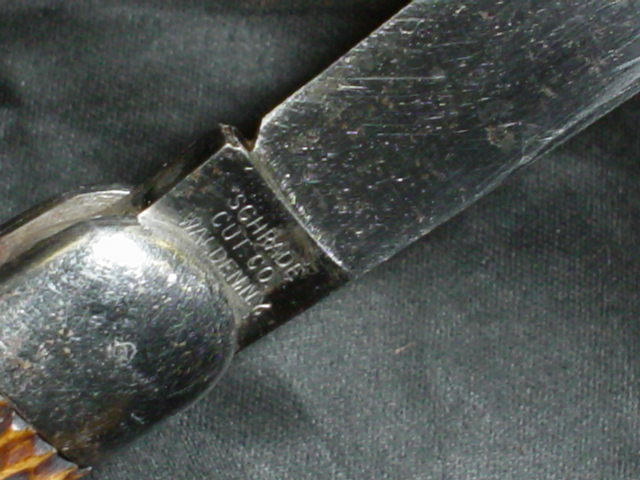 The base of the blade has the following information written: "Schrade, Cut Co, Walden N.Y.". The paratrooper knife was carried in a small pocket near the breast area of the paratrooper tunic . This edge weapon is currently being reproduced. It is becoming more difficult to be able to tell the fake ones from the real ones because the quality of the reproductions is improving. The collector must become familiarized with the construction style and materials employed in the manufacturing of this item. Attention to the details is critical in order to be able to determine the authenticity of the collectible. If you have an interest is seeing other fighting knives, you can do so by going to our Military Fighting Knives Price Guide identification guide. Where we cover Army, Navy, Army Air Force, USMC and other organizations. The value for the Fighting Knives and other military antiques and collectibles is provided as a means to educate the collector community and individuals who have a general interest on the field. The following is an estimated value. Prices may vary in every state and every country. This service is provided courtesy of MilitaryItems.com . The source for military antiques and collectibles in the web.